Jesus suffered for humanity, but he also suffered with humanity. His wail of torment on the cross expressed, to the deepest depth, the feeling of godforsakenness that is often a part of human experience. 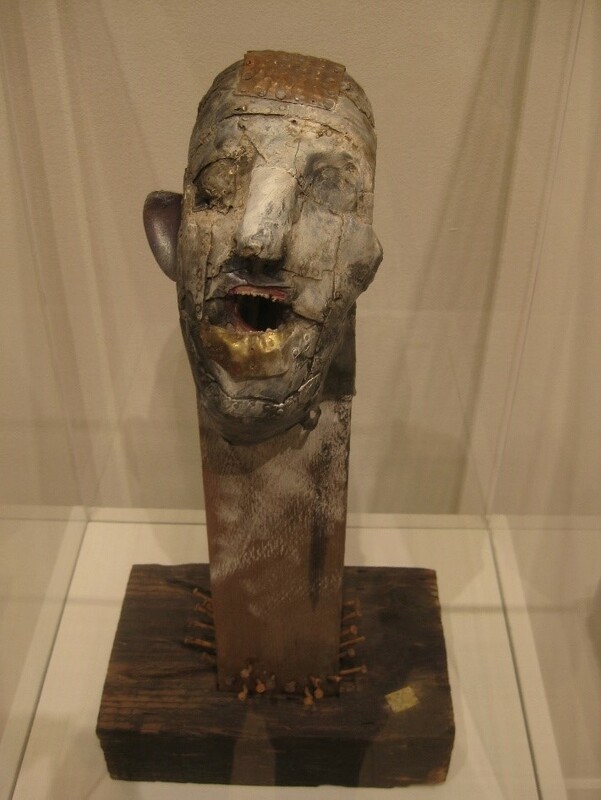 This primal wail is visualized in Rick Bartow’s mixed-media sculpture After Van Gogh—a disfigured face mounted on a rough wooden beam, eyes swollen shut, mouth agape, pierced through with a mass of protruding rusty nails at its base. Besides amplifying the violence of the image and evoking, loosely, the Crucifixion, these nails give the sculpture some semblance to the fetish objects of Kongo, called minkisi minkondi (sing. nkisi nkondi), through which the Kongo drive nails to petition the spirit inside to act as either guardian, healer, avenger, or witness to a pledge. Bartow saw nkondi figures at the Portland Art Museum in the early 1990s around the time he created After Van Gogh and was intrigued. Bartow too knew searing pain; much of his art is defined by it. As a member of the Wiyot tribe, he carried with him his culture’s collective memory of the 1860 massacre on Indian Island off the coast of Northern California, in which the Wiyot population was decimated by a group of white settlers. Not only did Bartow bear historical and psychological wounds, he also suffered personal loss when in 1999 his wife Julie died of cancer at age fifty. He was devastated. Later he encountered setbacks to his own physical health, including two strokes, which left his speech impaired, and heart disease, which eventually claimed his life in 2016. After Van Gogh is difficult to look at because of its grotesqueness. One’s immediate reaction may very well be to recoil. But to behold pain—to really see and acknowledge it—and to hold the pained one in love, is a Christian act. That goes for Christ, whose self-sacrifice on our behalf compels our contrition, our adoration, and for all this wounded, woeful world that cries out for liberation. Rick Bartow: After Van Gogh, 1992. Lead, wood, nails, crab claw, copper, and acrylic, 23 × 12 × 7 in. Private collection. Photo: Victoria Emily Jones. Richard Elmer “Rick” Bartow (1946–2016) was born and raised in Newport, Oregon. His father, of the Mad River Band of Wiyot people from Northern California, died when Bartow was young, and his extended family raised him to know the cultural traditions of the Siletz Indians. On his non-Native mother’s side, he had exposure to Christianity, so he grew up with a foot in both spiritual communities; as he put it, he “would go to the sweat lodge on Saturday and to church on Sunday!” Bartow’s drawings, paintings, sculptures, and prints have been the subject of over one hundred solo exhibitions and are in the permanent collections of many American museums. His large-scale commission We Were Always Here, two cedar posts depicting Bear and Raven, overlooks the National Mall in Washington, DC. In 2015, Bartow’s thirty-five-year retrospective, “Things You Know but Cannot Explain,” opened at the University of Oregon’s Jordan Schnitzer Museum of Art in Eugene, Oregon. This show, which includes After Van Gogh, will continue to travel the US through 2019. Victoria Emily Jones lives in the Baltimore area of the United States, where she works as an editorial freelancer and blogs at ArtandTheology.org. Her educational background is in journalism, English literature, and music, but her current research focuses on ways in which the visual arts can stimulate renewed theological engagement with the Bible. She serves on the board of the Eliot Society, a DC-based nonprofit that fosters discussions about the role of the arts in the life of the church, and as a consultant for the Visual Commentary on Scripture, an online biblical art project being developed by King’s College London.